One of the reasons the hike is so popular is because it's doable by most active healthy people. It's not technical and can be hiked in less than 8 hours. Around 120,000 people complete the hike per summer. The Tongariro Alpine Crossing is about 19.4 km and traverses a volcano. The total climb from the Mangatepopo start to Red Crater, the highest point on the track, is about 766m. Most of the ascent happens in two big climbs. The first climb starts at Soda Springs and climbs to the edge of South Crater. This section is well formed with hundreds of steps. The second and last big climb is from South Crater up to the Red Crater. Parts of this section get relatively steep and loose underfoot with no steps. While you don’t need special skills for either climb, you do need heart and lung power. You will breath hard and you will sweat. We all do. Each climb will take between 45 minutes to 75 minutes. The Devils Staircase is the section of old track from Soda Springs to the South Crater which is no longer used. It was named decades ago well before the new and existing track was built. The old track was a polled route and not a track as such. The terrain was a relatively young lava flow which meant it was rugged. It was steep and technical. The new and existing track is well formed and is stepped and not technical at all. The average time it takes to hike the Crossing is around 8 hours. This includes taking 300 photos and a leisurely lunch break. The actual walking time for most people is around 5 hours 30 minutes. Fast hikers will complete the walk in under 4 hours. For those of you who suffer from vertigo climbing the last section to the top of Red Crater can be a challenge. If you're concerned talk to others who have done the hike. In my experience only one person I know of who suffered vertigo did not make it over Red Crater and had to turn back. He did tell me his vertigo was severe. The descent from Red Crater down to the Emerald Lakes is quite steep and very loose underfoot. You need to take extra care on this section. Digging your heels into the loose scree and trying not to brake too much can help. Walking poles can be helpful on this section. The descent from Red Crater to the Ketetahi finish is 1126m. While this sounds easy, it can be tough on your legs. Your quadriceps and knees will work hard on the 10km down hill. If you have bad knees the down hill can be a struggle and good reason to consider not doing the Crossing. You’ll need extra energy and endurance to hike the Crossing in bad weather, or on a hot sunny day. The trick is to be well prepared for good and bad weather on any given day as conditions can change quickly. A good quality rain jacket to keep you dry for the entire hike is essential. And plenty of warm layers to keep the cold away. Sun protection is a must on a hot sunny day. Once the sun is up there is little shade on the Crossing. Pack food and water to keep energised and hydrated. Having good gear can make all the difference. 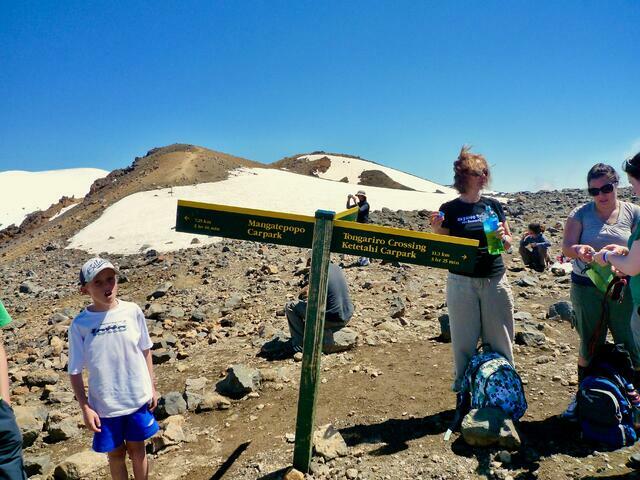 The youngest person I know who hiked the Tongariro Crossing was 4 years old. This little Australian wanted to go running with me when he got back to the lodge. We did laps around Discovery until it was dinner time. He was amazing. The oldest I know of was 96. What an incredible lady she was. Her 70 year old daughter did it with her. I met them waiting for their pick up at the Ketetahi finish. I asked her how she was. She leaned over a little, rubbed her knees and all she said was “my knees are a little bit sore”. Inspirational! I also know of a 85 year old blind man who completed the hike. I didn’t realise he was blind when he boarded the bus in the morning with his family. At the Ketetahi finish he had a big smile. His family told me they were worried I wouldn’t let him on the bus if I had known. Actually, I would been very happy to help him with his wish. The man had hiked the Crossing many times in his younger years and lost his eye sight as he got older. He wanted to feel the freedom and joy of being on the Crossing one more time. Once again, inspirational! I know of many over weight people who have completed the hike. They have all known exactly what they’re in for and were up for the challenge. They all had the right gear, the knowledge and a "can do" attitude. Again, inspirational stuff! 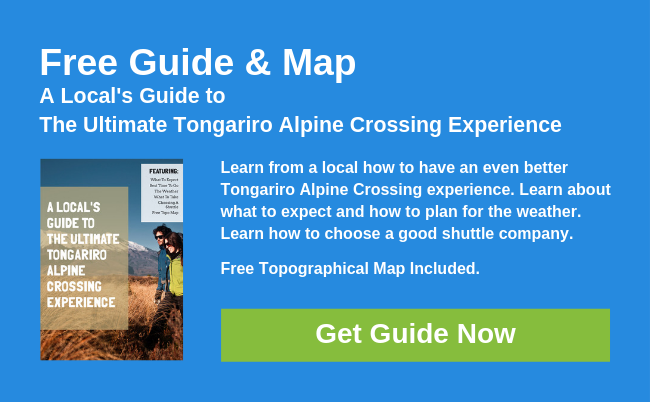 So is the Tongariro Alpine Crossing difficult? If you’re healthy and active and it’s likely you can do it. And if the weather is good and you’ve got all the right gear it'll be that much easier and enjoyable. If you’re unsure talk with someone you know who's hiked the Crossing. Or find a local mountain expert for advice.